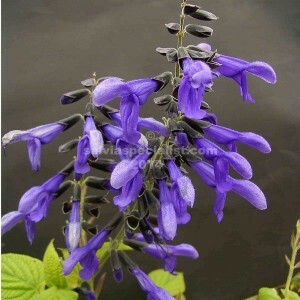 This shrub to 2m is a must for most gardens because of its large heads of purple blue flowers in the cooler months. It is somewhat open in growth so needs to be cut back a bit to bush it up or just use it as a background plant. It is a bit frost tender and not especially drought hardy. It will grow in sun or part shade. ’Costa Rica Blue’ is easy to grow from cuttings or it will layer if given the opportunity. Legend has it that this salvia was found at the Costa Rica Hotel in Panama and that originally there was also Costa Rica Pink also. ’Omaha Gold’ must be a close relative. It has the same beautiful flowers but a gold edge to the leaves, particularly obvious in winter on new leaves. Because of the variegation it is not as strong a plant as ‘Costa Rica Blue’ and will likely be much shorter.